Since the world is preparing for the opening of the 2012 Summer Olympics in London I thought I’d pull to the top of the pile the blog post about the 1912 Olympics in Sweden. 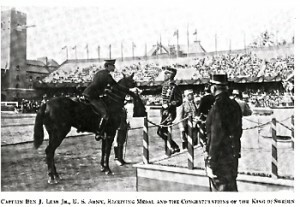 100 years ago the first Army Equestrian Olympic team had little time to prepare their horses for the 1912 Olympics in Stockholm. Captain Ben Lear a member of the team, wrote a fascinating account of the team preparation and participation for the Cavalry’s 1913 yearbook, The Rasp. I hope you enjoy this first of three blog posts. By Captain Ben Lear, jr., Fifteenth Cavalry. First Lieutenant Ben Lear, Jr., Fifteenth Cavalry. First Lieutenant John C. Montgomery, Seventh Cavalry. First Lieutenant Ephraim F. Graham, Fifteenth Cavalry. Second Lieutenant John G. Quekemeyer, Fifth Cavalry. These officers were to report to the Commanding Officer, Fort Riley, Kansas, for preparation. Captain Henry and Lieutenants Lear and Montgomery were on duty at the Mounted Service School at the time the order was received. Lieutenants Quekemeyer and Graham were with their regiments and did not report until March 1 and 26, respectively. On the first day of April, Lieutenant A. L. P. Sands, Sixth Field Artillery, stationed at Fort Riley, was added to the team. Within about a week from the date the order was received training commenced. 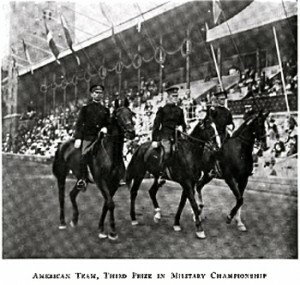 At Fort Riley, the only horses available for the competitions were those at the school, and, after careful consideration, the following were selected for a “try-out:” Bill Stone. Chiswell, Connie, Deceive, Fencing Girl, Mabel Anderson, Norma S., Nymph, Poppy, Prim, Quandry, Roustabout, Scioptic, Sen Glen, Stratta and Timberlost. Captain Henry’s Bazan, Lieutenant Montgomery’s Lady Foxhall, and Lieutenant Henry L. Watson’s Chesapeake were turned over to the team by their owners. In all, nineteen horses were put in training. As soon as the frost was out of the ground, an obstacle course, similar to the one prescribed for the Olympic Games, was constructed in the old race track grounds. A 15 mile cross-country course, without jumps, was also staked out. The railway gates, triple bar, stone wall and fence jumps were provided for jumping in the riding hall. First: A long distance ride of about 31 1/2 miles, to be completed in three and three-fourths hours. Second: A cross-country ride of 3-1/3 miles, to be completed in fifteen minutes. (This event occurred after some twenty miles of the long distance ride had been ridden). Third: Riding over a steeplechase course of 2 1/2 miles with ten obstacles, in five minutes and fifty seconds. Fifth: Schooling of the horse and the marking of his appearance at all gaits. Each of the first four tests had to be completed within a certain maximum time, and failure to finish within the time allowed was very heavily penalized. In the cross-country test and steeplechase penalties were also given for refusals, falls and the bolting of the horse. For the jumping event, points for tips and knockdowns were added to the penalties already mentioned. During February and March, little outdoor work could be done further than walking in the deep snow. A great deal of longeing over low jumps in the riding hall was done, running reins being used on horses inclined to rush their jumps. On three days each week the horses were jumped several times over low hurdles at the walk, trot and canter. Systematic work with the horses was very much handicapped, due to the fact that two of the officers were instructors in the Department of Equitation in the Mounted Service School and one in the Department of Horseshoers and Farriers, these three officers being required to keep up their regular school work and to attempt to do their work with the Swedish horses in addition thereto; also the riding hall was only available for one and one-half hours per day for work with the Swedish horses. About April 1, Lieutenant Sands was badly injured by his horse falling at a jump and was unable to do any further duty for approximately six weeks. Between this and the date of departure for New York, June 8, three regular “try-outs” were had and the final selection of the horses made. About June 1, Lieutenant Quekemeyer was forced to drop out due to his collar bone having been broken by his horse falling at one of the obstacles. Lieutenant Sands in the meantime had returned to work. Definite information was then received that the team was to consist of four officers, six horses and three enlisted men, and that all were to sail on the steamship “Finland” from New York, June 14. Lieutenant Colonel Frederick S. Foltz, General staff. United States Cavalry, was ordered by the War Department to take charge of the team. While in Stockholm, and also while traveling to and from that place, he did everything possible, officially and personally, to make our visit a pleasant one, and was a source of considerable encouragement to the various members of the team. We certainly enjoyed being with Colonel Foltz. The work and trials at Fort Riley convinced us that we would put up a good representation and that our horses were very fair, all round animals, but as horses and jumpers would hardly be able to compete with those which we expected to meet at Stockholm. The horses finally selected were Chiswell, one of the horses presented to the United States Government two years ago for the purpose of going to the London Horse Show; Deceive, a thoroughbred assigned to Lieutenant Montgomery ; Bazan, personal property of Captain Henry, Connie, Poppy and Fencing Girl, regular army horses bought at the contract price. A horse that was capable of completing the above tests must be a thorough military animal; that is, one with strength, endurance, speed, jumping ability and complete training. The horses that we started working with had practically none of these conditions except in the rough and all of them had to be developed within three months and this at a time of the year not well suited for the work. Many horses could have been found which combined one or more of the necessary qualities, but the difficulty was to find a horse which combined all of the qualities in a sufficient degree to admit of his entering the team. The horses left for New York by express on June 10, arriving there June 12, and loaded on board the “Finland” June 14. On board the ship they were very comfortable, with plenty of fresh air, and during the trip were exercised by being led from one to one and a half hours a day around a small circle on the lower deck about twenty-five yards in circumference. While this was not much exercise it was of the greatest value to us in the end as it kept their muscles in fair condition and held their gaining flesh down to some extent. During the entire trip their feed was held low with one large feed of bran mash per day, and to those horses that would eat them carrots were fed.